Walter J. Branson, vice president for finance and operations and chief business officer, presented the fiscal 2019 budget during a meeting of the Board of Trustees June 8. 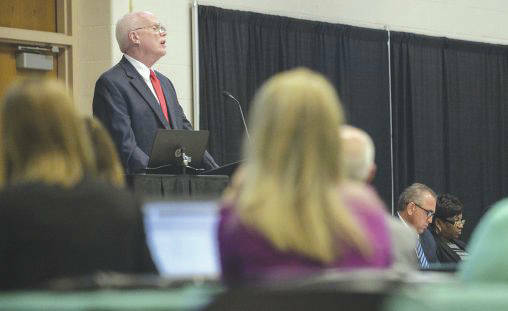 Submitted photo During the presentation of the university’s fiscal 2019 budget, President Cheryl B. Schrader reported that Wright State is on track to avoid fiscal watch. FAIRBORN — Emerging from years of overspending and budget deficits, Wright State University will post a $7.2 million budget surplus this year and has crafted a fiscal 2019 budget with a $3 million surplus that earmarks funds for strategic investments to bolster tuition revenue and build the university’s future. 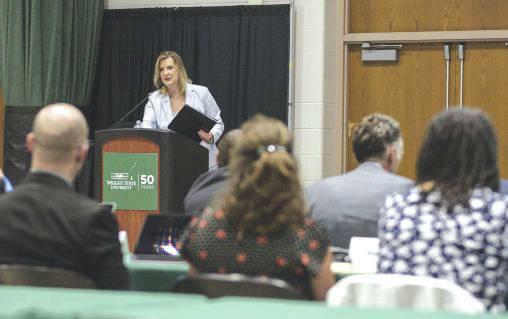 The information was part of the fiscal 2019 budget presentation made June 8 by President Cheryl B. Schrader and Walter J. Branson, vice president for finance and operations and chief business officer, to the Board of Trustees. The trustees approved the budget by a vote of 7-to-1. Schrader said the $7.2 million surplus will exceed the $6 million surplus originally budgeted and will be the first surplus since fiscal 2013. By June 30, the end of fiscal 2018, it is expected Wright State will have spent $50 million less than it did the previous year, exceeding the $30.7 million reduction called for in the original budget. Avoiding fiscal watch would enable the university to achieve financial sustainability in its own time and use some of its resources to invest in its future. Schrader said the fiscal 2019 budget is a challenging one. The preliminary fiscal 2019 budget assumes that state support will decline 1.61 percent — a $1.4 million decrease from fiscal 2018 — and that enrollment credit hours will decline by 6.2 percent. The budget projects revenue of $277.6 million, which includes $164.8 million from tuition and $84.6 million from the state. That compares to previous revenues of $306 million in fiscal 2017 and $287 million in fiscal 2018. Expenses in fiscal 2019 are expected to total $274.6 million, leaving the $3 million surplus. Objectives of the fiscal 2019 budget include maintaining the instructional and educational components of the university’s mission as the highest priority; continuing to restore reserves; providing funding for strategic investments; and continuing to emphasize a strong culture of fiscal accountability. Under the budget, there will be no annual increases in salaries and wages. Promotion and tenure salary increases will continue. There will be no tuition increases for resident undergraduate students, a 3 percent increase for non-resident undergraduate students and graduate students, and a 6 percent increase for the incoming cohort of students in the Wright Guarantee Tuition Program, which guarantees the same annual cost of tuition, housing and dining over a four-year college career for newly admitted, degree-seeking undergraduate students who are Ohio residents. Wright State continues to rank among the most affordable for in-state undergraduate students, at $8,730 per year. The fiscal 2019 budget budgets for things not previously included such as an additional $5.5 million for medical claim expense overage experienced in 2018, $3.2 million for previously unbudgeted graduate tuition and college credit plus waivers and $1 million in strategic investments to bolster tuition revenue. “If we didn’t budget for medical claims and fee waiver increases alone, we would show a $12 million surplus instead of $3 million, even when accounting for enrollment declines,” Schrader said. Administration officials believe there will be some job reductions this year, but the majority will come from vacant positions. Schrader said there would be layoffs but likely much fewer than the 47 last year. Wright State currently employs more than 3,300 people. And about 200 employees cycle out of university employment in any given year. The administration is working on a fiscal sustainability plan that includes initiatives to increase fall enrollment, which is projected to be 16,224 students, down from 17,108 a year ago. Among Ohio’s four-year public universities, Wright State is among nine of 13 that experienced flat or declining full-time-equivalency enrollments from fiscal 2012 to fiscal 2017. Nationally, enrollments declined by 4.6 percent as compared to a decline of 7.7 percent in Ohio. Schrader said significant changes are being made to Wright State’s international recruitment and enrollment strategy, which primarily concentrated on two countries, making it sensitive to governmental policy changes. New strategies will target both undergraduate and graduate students and will use a more diversified approach. The university will expand recruitment in top and emerging markets; develop relationships with universities in Andhra Pradesh, India; provide incentives for international recruiting agents; and test targeted scholarships. On the domestic side, Wright State is working closely with its partner Ruffalo Noel Levitz to optimize enrollment yield. It will also become a member institution for the Common Application and employ enhanced marketing strategies. The university is also working to improve student retention through co-requisite remediation in both mathematics and English, by expanding proactive advising and the early alert system, and implementing centralized advising and career services models. Several trustees suggested the university put a greater emphasis on revenue growth. Board Chairman Douglas Fecher said Wright State is in a better place budget-wise than it was a year ago. But he said the university still needs to attack the budget process with urgency and be creative in its approach. https://www.fairborndailyherald.com/wp-content/uploads/sites/50/2018/06/web1_walt-branson-budget-presentation-20209_027-508×311.jpgWalter J. Branson, vice president for finance and operations and chief business officer, presented the fiscal 2019 budget during a meeting of the Board of Trustees June 8.
https://www.fairborndailyherald.com/wp-content/uploads/sites/50/2018/06/web1_President-Cheryl-B-Schrader-budget-presentation-20209_015-508×319.jpgSubmitted photo During the presentation of the university’s fiscal 2019 budget, President Cheryl B. Schrader reported that Wright State is on track to avoid fiscal watch.